Today’s post is sponsored by DeLallo! And, um, just in case you hadn’t noticed, Pinch of Yum ♡’s DeLallo. Salmon burgers! WHO AM I! This is totally not something I would normally think to make, because 1) 90% of what I eat right now is Magic Green Sauce, soooo there’s that, and 2) I’m just not creative enough to think to make a BURGER out of SALMON. When I think burger, I think Juicy Lucy or some variation of it from The Nook, The Blue Door, Matt’s Bar… basically the greasiest, grungiest, most awesome burger places in the world that all happen to be in my non-pretentious little Minnesota corner of the world. If you haven’t booked your flight to partake in these famed cheese-stuffed burgers yet, please get your priorities straight. Okay, but enough. Today we’re going pinkies up and swapping the cheese bomb burger for a light and fresh salmon burger atop a beautifully sweet, crunchy, herb-fresh salad. I feel like I should be wearing a big straw hat and sipping on a Perrier with a slice of lemon as I tell you about this meal. That’s just the salmon burger vibe. So like I said, this would never be something I’d be all that inclined to come up with on my own, but lucky for me (and you! ), I went to California a few months ago and got together with a bunch of genius food bloggers who actually scraped together our salmon leftovers from dinner to make salmon burgers the next day at lunch. Say whaaaat? I was in shock and awe at the deliciousness of salmon in burger form. One of the bloggers who was there, Gina from the amazing Skinnytaste, went home and wrote up the recipe for the salmon burgers and I knew as soon as I saw it that I had to had to had to try it on my own. 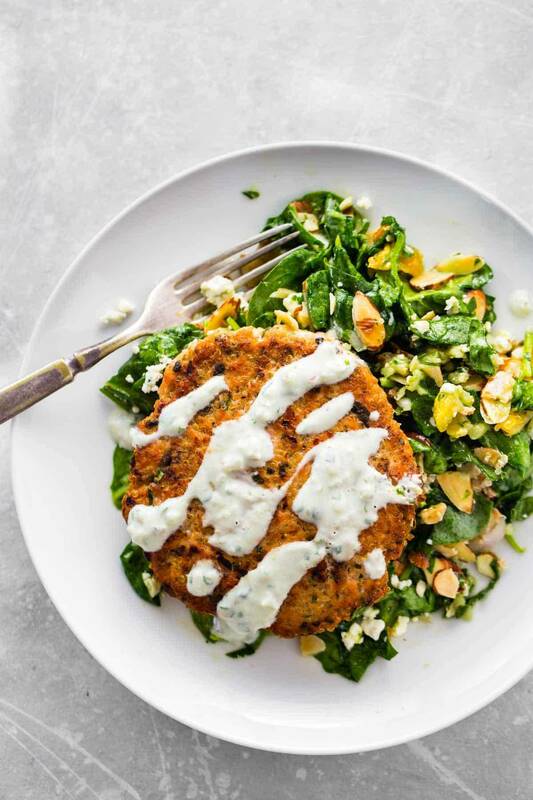 Of course, I couldn’t not give the salmon burgers a really summery feel with lemon and herbs, and in keeping in line with the salmon burger fancy healthy vibe, I had to eat it on a pear, gorgonzola, and almond spinach salad topped with an herb-loaded dressing. HI THERE YUMMY. You guys, I’m about to blow your mind. We actually have DeLallo to thank for the easy salad prep. Those dried pears, gorgonzola crumbles, and toasted almonds are already packed up and ready for us in this Bold DeLallo SaladSavors® dealio which can be found in the refrigerated produce section of the grocery store. I can’t even tell you how often I use these – mostly for last minute friends-are-coming-over dinners when all I need to do is toss them with some spinach and a little vinaigrette. Yes please. Who even knew that life could be so awesome?! This meal is a lot of wonderful things to me, so let me just go ahead and count the ways. So now I’m a person who makes salmon burgers. I think that means that I get to be all those things on the list, too? Er, no. Weird. Summer is HERE! June, I love you. It’s time to get your lemon herb salmon burgers onnnn. Lemon Herb Salmon Burgers – a healthy, fresh recipe that is a MUST for salmon lovers! A light burger atop a beautifully sweet, crunchy, herb-fresh salad. Mince the shallot and herbs. Set aside two tablespoons of the shallot/herbs for the dressing. Saute the remaining shallot and herbs in a little olive oil over medium high heat for a few minutes to remove the bite (not totally necessarily, but it helps the flavor in my opinion). Pulse the salmon 2-3 times briefly in a food processor until well chopped and a little bit sticky. Stir together with the quinoa, eggs, seasoning, lemon juice, salt, pepper, and the shallots and herbs from step one. Shape the mixture into four patties. Heat a small drizzle of oil in skillet over medium high heat. Fry the patties one at a time (unless you have a huge griddle that can fit more), flipping once after 3-4 minutes. The patties should be golden brown on the outside and fully cooked on the inside. Place all the dressing ingredients in a jar and shake until combined (don’t forget the reserved shallot and herbs from step one). Set a little bit aside and toss the rest with the salad ingredients. Serve burgers over salad! Mix the reserved dressing with a little bit of greek yogurt or mayonnaise for a herb-dip-type-sauce and serve it over the salmon burgers. And feel fresh and healthy. Nutrition information is for the salmon burgers and does not include the salad. Thank you to DeLallo for helping me rock the salmon burger recipe! Tried the recipe last night and my wife and I really enjoyed it. Never made a salmon burger with fresh salmon before. One comment..recipe suggests adding “a little” yogurt or mayonnaise to dressing for a dip like sauce. Added close to 3-4 tablespoons before got it to a “dip” like consistency. In case it is perhaps maybe not homade this really is a superb recipe and also also your sauce it’s not the same! I have been shifting the recipe in your home and made an Asian model having a hot broccoli slaw to consume top! can these be frozen and reheated or refrigerated and re heated? Trying them in my gourmet store ! Looking for really healthy alternatives for dinner for my clients . Thanks for the inspiration. I hope they are a hit !